This chapter concentrates on the subject of financing education and the share in that financing of two layers of the governmental sector, the union and the states in it. There has been continuous controversy regarding centre–state relations in financing education in India since the problem of finances for education has reached “the proportions of a crisis for the Central as well as the state government.” Some scholars argue that education is of such great national importance that it cannot be the total responsibility of the states. 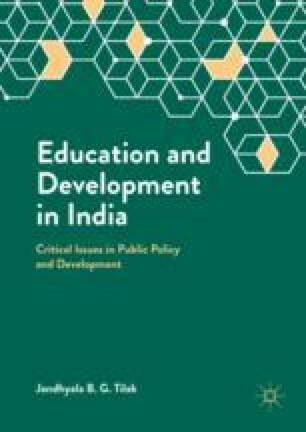 In contrast, proponents of decentralised political philosophy argue that, in a vast and diverse federal polity like India, the interests of education should be the total responsibility of state governments. Analysing these views, this chapter begins with a historical perspective on the problem, moves to an in-depth discussion of the role of the planning and finance commissions through which major transfers of educational resources from the centre to the states take place, and ends with a summary and some tentative observations on the debate mentioned above. Published in Comparative Educational Review 33 (4) (November 1989): 450–80. © Comparative and International Education Society, University of Chicago Press. This was an invited paper for the sixth World Congress of Comparative Education organised by the Brazilian Comparative Education Society at Rio de Janeiro (July 6–10, 1987). I am grateful to George Psacharopoulos for his encouragement and to N.V. Varghese, S.N. Saraf, and A. Mathew for their comments on earlier versions. Very helpful comments were also received from two referees. However, the remaining errors and the views expressed here are mine alone and should not necessarily be attributed to anyone else, including the World Bank, where I am currently working.